Please note: Fistula Foundation is not currently funding active work in Senegal. Why Did We Work in Senegal? While maternal health indicators have gradually improved in Senegal over the last several years, the numbers often do not reflect the dramatic differences between urban and rural areas. 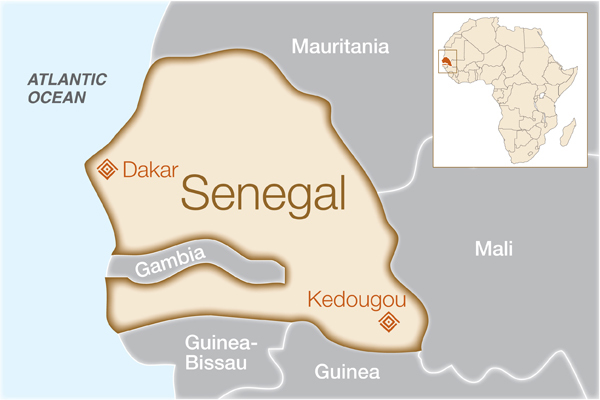 Poverty, limited healthcare infrastructure, lack of trained medical staff and access to emergency obstetric services, and early marriage are all common in remote parts of Senegal and contribute to an increased risk of fistula. There is also an ever-growing backlog of cases throughout the country. How much funding did we grant? We provided grant support directly to CIRFO and Tostan International. We provided grant support for all-terrain ambulance vehicles and to Kedougou Hospital through Women and Health Alliance International (WAHA). How has this helped women in Senegal? One of the biggest contributing factors to obstetric fistula is a long delay between the time a woman goes into labor and the time she arrives at a health center for medical care. This is often due to the high cost of transport and/or inaccessibility of roads in rural areas. To address this problem, we funded the purchase of all terrain ambulance vehicles (ATVs) in the Kedougou region through WAHA. These vehicles can navigate rough terrain in ways that traditional ambulances cannot, which allows more women to be transported to sites where they can receive timely emergency obstetric care and fistula services. We also provided funding for much-needed upgrades and repairs to Kedougou Hospital’s operating theater. This included the purchase of operating tables, lighting, a diathermy machine, and all medical supplies necessary for performing fistula surgery. In partnership with hospital officials, WAHA also worked to increase patient demand for better obstetric and fistula services and assist fistula patients reintegrate into their communities following surgery. Tostan International has received international acclaim for its community-based development model, working in local languages and utilizing traditional methods of communication and learning. Fistula Foundation provided Tostan with funding in 2012 to conduct a needs assessment of communities in Senegal that formed the basis for a comprehensive fistula prevention and treatment program in the regions of Kedougou, Kolda, Ziguinchor, Tambacounda and Matam. The goal of the study was to provide the fistula treatment community with a better understanding of the social, cultural, economic and resource-related challenges that serve as barriers to fistula prevention and treatment in Senegal, as well as to address the issues of social reintegration of women who have received fistula treatment. Under the leadership of renowned fistula surgeon Dr. Serigne Gueye, the National Training and Fistula Reparation Center (CIRFO)’s project had two main components: increasing the number of complex fistula surgeries performed at CIRFO, and training more surgeons to be able to perform fistula surgeries locally. With funding from Fistula Foundation in 2011, CIRFO was able to meet these objectives. Not only did they perform 100 complex surgeries at the center, but they also trained 20 Senegalese doctors and surgeons, 10 nurses, 8 anesthesiologists, and a number of doctors from other West African nations.